Journalist Robert Fisk returns to the Sabra and Shatila Palestinian refugee camps in Lebanon. Fisk recounts how Lebanese Christian militias who were under the control of the Israeli military murdered over 2000 Palestinians in the camps. Fisk also points to a building in the distance from where he insists the Israeli forces could witness the massacre. The Israeli government's own Kahan Commission found that future Israeli Prime Minister Ariel Sharon was personally responsible for the massacre. This is from a documentary Fisk made about "why so many Muslims have come to hate the West." 55. Address by Prime Minister Begin at the National Defense College, 8 August 1982. A classic war of no alternative was the Second World War waged by the Allies. On August 23, 1939, Great Britain stood helpless. Although she still had an empire embracing an area of 40 million square kilometres, on which the sun never set, her prestige had sunk deep in the seven seas over which it still ruled, though no longer exclusively. And so war broke out on September 1, 1939, when the Nazi German army crossed the Polish-German border. Poland fought because she had no alternative. Within three day the Polish army was crushed and the Polish state ceased to exist. This was, then, a war of no alternative for Poland, a war without option for France and a war without choice for Russia. What price did humanity pay for this war of no alternative? Between 30 and 40 million killed, three times this number wounded, among them six million Jews - the only people against whom the Nazi Germans used gas. (Hitler had a very large stock of gas, but he did not use it against other peoples, for fear of the reaction). This is the terrible consequence of a war of no alternative. All mankind was placed on the edge of the abyss, when Nazi Germany was not far from total victory. In 1944, Germany was close to developing the atom bomb. Was it possible to prevent the Second World War? Today, thanks to research and the facts known to us, there is no longer any doubt about the answer: Yes, indeed, it was possible to prevent it. On March 7, 1936, Hitler announced that he was abrogating the Treaty of Versailles. In order to implement his decision, he introduced two battalions of the German army into the demilitarized Rhineland. At that time, two French divisions would have sufficed to capture all the German soldiers who entered the Rhineland. As a result of that, Hitler would have fallen. His prestige would have crumbled. At that time, he did not yet have an army worthy of the name, only gangs of SS, SA and Gestapo. Two French divisions, with their tanks, and with the air force at their disposal, would have blasted this entire German armed force to the four winds. If this had happened, the Second World War would have been prevented, more than 30 million people would have remained alive, tens of millions of others would not have been wounded and the tragedy of Hiroshima would have been averted. Humanity would have looked different today. The six million Jews slaughtered then would today be more than 12 million, and the whole of Eretz Yisrael would be in our hands. The Second World War, which broke out on September 1, 1939, actually began on March 7, 1936. If only France, without Britain (which had some excellent combat divisions) had attacked the aggressor, there would have remained no trace of Nazi German power and war which, in three years, changed the whole of human history, would have been prevented. This, therefore, is the international example that explains what is a war without choice, or a war of one's choosing. Let us turn from the international example to ourselves. Operation Peace for Galilee is not a military operation resulting from the lack of an alternative. The terrorists did not threaten the existence of the State of Israel; they "only" threatened the lives of Israel's citizens and members of the Jewish people. There are those who find fault with the second part of that sentence. If there was no danger to the existence of the state, why did you go to war? I will explain why. We had three wars which we fought without alternative. The first was the War of Independence, which began on November 30, 1947, and lasted until January 1949. It is worthwhile remembering these dates, because there are also those who try to deceive concerning the nine weeks which have already passed since the beginning of Operation Peace for Galilee. This was a war without alternative, after the Arab armies invaded Eretz Israel. If not for our ability, none of us would have remained alive. What happened in that war, which we went off to fight with no alternative? Six thousand of our fighters were killed. We were then 650,000 Jews in Eretz Israel, and the number of fallen amounted to about I percent of the Jewish population. In proportion to our population today, about I percent would mean 30,000 killed and about 90,000 wounded. Could we live with such losses? Let us imagine 30,000 soldiers killed, the best of our youth, those who say, "Follow me! " We carried on our lives then by a miracle, with a clear recognition of life's imperative: to win, to establish a state, a government, a parliament, a democracy, an army - a force to defend Israel and the entire Jewish people. The second war of no alternative was the Yom Kippur War and the War of Attrition that preceded it. What was the situation on that Yom Kippur day [October 6, 1973]? We had 177 tanks deployed on the Golan Heights against 1,400 Soviet Syrian tanks; and fewer than 500 of our soldiers manned positions along the Suez Canal against five divisions sent to the front by the Egyptians. Is it any wonder that the first days of that war were hard to bear? I remember Aluf Avraham Yaffe came to us, to the Knesset Foreign Affairs and Defence Committee, and said: "Oy, it's so hard! Our boys, 18- and 19-year-olds, are falling like flies and are defending our nation with their very bodies." In the Golan Heights there was a moment when the O/C Northern Command - today our chief of staff - heard his deputy say, "This is it." What that meant was "We've lost; we have to come down off the Golan Heights. And the then OIC said, "Give me another five minutes". Sometimes five minutes can decide a nation's fate. During those five minutes, several dozen tanks arrived, which changed the entire situation on the Golan Heights. If this had not happened, if the Syrian enemy had -come down from the heights to the valley, he would have reached Haifa - for there was not a single tank to obstruct his armoured column's route to Haifa. Yes, we would even have fought with knives - as one of our esteemed wives has said - with knives against tanks. Many more would have fallen, and in every settlement there would have been the kind of slaughter at which the Syrians are experts. In the south, our boys in the outposts were taken prisoner, and we know what happened to them afterwards. Dozens of tanks were destroyed, because tanks were sent in piecemeal, since we could not organize them in a large formation. And dozens of planes were shot down by missiles which were not destroyed in time, so that we had to submit to their advances. Woe to the ears that still ring with the words of one of the nation's heroes, the then defence minister, in whose veins flowed the blood of the Maccabees: "We are losing the Third Commonwealth." Our total casualties in that war of no alternative were 2,297 killed, 6,067 wounded. Together with the War of Attrition -which was also a war of no alternative - 2,659 killed, 7,251 wounded. The terrible total: almost 10,00 casualties. Our other wars were not without an alternative. In November 1956 we had a choice. The reason for going to war then was the need to destroy the fedayeen, who did not represent a danger to the existence of the state. However, the political leadership of the time thought it was necessary to do this. 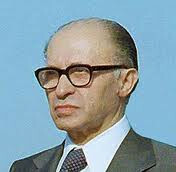 As one who served in the parliamentary opposition, I was summoned to David Ben-Gurion before the cabinet received information of the plan, and he found it necessary to give my colleagues and myself these details: We are going to meet the enemy before it absorbs the Soviet weapons which began to flow to it from Czechoslovakia in 1955. I said: "We shall stand together, with no reservations. This is a holy war." And indeed, we stood together until the withdrawal, without a peace treaty and without the demilitarization of Sinai. Thus we went off to the Sinai Campaign. At that time we conquered most of the Sinai peninsula and reached Sharm e-Sheikh. Actually, we accepted and submitted to an American dictate, mainly regarding the Gaza Strip (which David Ben-Gurion called "the liberated portion of the homeland'). John Foster Dulles, the then secretary of state, promised Ben-Gurion that an Egyptian army would not return to Gaza. The Egyptian army did enter Gaza. David Ben-Gurion sent Mrs. Meir to Washington to ask Foster Dulles: "What happened? Where are the promises?" And he replied: "Would you resume the war for this?" After 1957, Israel had to wait 10 full years for its flag to fly again over that liberated portion of the homeland. This was a war of self-defence in the noblest sense of the term. The government of national unity then established decided unanimously: We will take the initiative and attack the enemy, drive him back, and thus assure the security of Israel and the future of the nation. We did not do this for lack of an alternative. We could have gone on waiting. We could have sent the army home. Who knows if there would have been an attack against us? There is no proof of it. There are several arguments to the contrary. While it is indeed true that the closing of the Straits of Tiran was an act of aggression, a causus belli, there is always room for a great deal of consideration as to whether it is necessary to make a causus into a bellum. And so there were three wars with no alternative - the War of Independence, the War of Attrition and the Yom Kippur War - and it is our misfortunate that our wars have been so. If in the two other wars, the wars of choice - the Sinai Campaign and the Six Day War - we had losses like those in the no alternative wars, we would have been left today with few of our best youth, without the strength to withstand the Arab world. As for Operation Peace for Galilee, it does not really belong to the category of wars of no alternative. We could have gone on seeing our civilians injured in Metulla or Kiryat Shmona or Nahariya. We could have gone on counting those killed by explosive charges left in a Jerusalem supermarket, or a Petah Tikva bus stop. All the orders to carry out these acts of murder and sabotage came from Beirut. Should we have reconciled ourselves to the ceaseless killing of civilians, even after the agreement ending hostilities reached last summer, which the terrorists interpreted as an agreement permitting them to strike at us from every side, besides southern Lebanon? They tried to infiltrate gangs of murderers via Syria and Jordan, and by a miracle we captured them. We might also not have captured them. There was a gang of four terrorists which infiltrated from Jordan, whose members admitted they had been about to commandeer a bus (and we remember the bus on the coastal road). And in the Diaspora? Even Philip Habib interpreted the agreement ending acts of hostility as giving them freedom to attack targets beyond Israel's borders. We have never accepted this interpretation. Shall we permit Jewish blood to be spilled in the Diaspora? Shall we permit bombs to be planted against Jews in Paris, Rome, Athens or London? Shall we permit our ambassadors to be attacked? There are slanderers who say that a full year of quiet has passed between us and the terrorists. Nonsense. There was not even one month of quiet. The newspapers and communications media, including The New York Times and The Washington Post, did not publish even one line about our capturing the gang of murderers that crossed the Jordan in order to commandeer a bus and murder its passengers. True, such actions were not a threat to the existence of the state. But they did threaten the lives of civilians, whose number we cannot estimate, day after day, week after week, month after month. During the past nine weeks, we have in effect destroyed the combat potential of 20,000 -terrorists. We hold 9,000 in a prison camp. Between 2,000 and 3,000 were killed and between 7,000 and 9,000 have been captured and cut off in Beirut. They have decided to leave there only because they have no possibility of remaining there. They will leave soon. We made a second condition: after the exit of most of the terrorists, an integrated multi-national force will enter. But if the minority refuse to leave, you - the U.S., Italy and France - must promise us in writing that you, together with the Lebanese army, will force them, the terrorists, to leave Beirut and Lebanon. They have the possibility of forcing 2,000-2,500 terrorists who will remain after the majority leaves. And one more condition: if you aren't willing to force them, then, please, leave Beirut and Lebanon, and the I.D.F. will solve the problem. This is what I wrote the Secretary of State today, and I want you and all the citizens of Israel and the U.S. to know it. The problem will be solved. We can already now look beyond the fighting. It will end, as we hope, shortly. And then, as I believe, recognize and logically assume, we will have a protracted period of peace. There is no other country around us that is capable of attacking us. We have destroyed the best tanks and planes the Syrians had. We have destroyed 24 of their ground-to-air missile batteries. After everything that happened, Syria did not go to war against us, not in Lebanon and not in the Golan Heights. Jordan cannot attack us. We have learned that Jordan is sending telegrams to the Americans, warning that Israel is about to invade across the Jordan and capture Amman. For our part, we will not initiate any attack against any Arab country. We have proved that we do not want wars. We made many painful sacrifices for a peace treaty with Egypt. That treaty stood the test of the fighting in Lebanon; in other words, it stood the test. The demilitarized zone of 150 kilometres in Sinai exists and no Egyptian soldier has been placed there. From the experience of the 1930s, I have to say that if ever the other side violated the agreement about the demilitarized zone, Israel would be obliged to introduce, without delay, a force stronger than that violating the international commitment; not in order to wage war, but to achieve one of two results: restoration of the previous situation, i.e., resumed demilitarization, and the removal of both armies from the demilitarized zone; or attainment of strategic depth, in case the other side has taken the first step towards a war of aggression, as happened in Europe only three years after the abrogation of the demilitarized zone in the Rhineland. Because the other Arab countries are completely incapable of attacking the State of Israel, there is reason to expect that we are facing a historic period of peace. It is obviously impossible to set a date. It may well be that "The land shall be still for 40 years." Perhaps less, perhaps more. But from the facts before us, it is clear that, with the end of the fighting in Lebanon, we have ahead of us many years of establishing peace treaties and peaceful relations with the various Arab countries. The conclusion - both on the basis of the relations between states and on the basis of our national experience - is that there is no divine mandate to go to war only if there is no alternative. There is no moral imperative that a nation must, or is entitled to, fight only when its back is to the sea, or to the abyss. Such a war may avert tragedy, if not a Holocaust, for any nation; but it causes it terrible loss of life. Quite the opposite. A free, sovereign nation, which hates war and loves peace, and which is concerned about its security, must create the conditions under which war, if there is a need for it, will not be for lack of alternative. The conditions much be such - and their creation depends upon man's reason and his actions - that the price of victory will be few casualties, not many.